A tall, straight man in the prime of life, bronzed and gray-bearded, watched the parade of the Grand Army yesterday from a place near Governor Hill on the stand in Madison Square. It was the first turnout of the kind he had ever seen, and he stopped over in New York on purpose to witness it. His name is Hon. Samuel Dibble, and for eight years he has represented the First Congressional District of South Carolina. He is a big man -- mentally and physically -- and before entering Congress he bore a large share in the legislation at home that finally freed his State from the rule of the carpet baggers. He is, strange to say, one of the few representatives from the South who cannot be classified as "brigadier," for he entered the Confederate Army as a private at the beginning of the Rebellian [sic], served until the end, and came out carrying only the shoulder straps of a lieutenant. "It was a magnificent parade," said Mr. Dibble last night, "and I notice that the bands didn't forget our old tune of 'Dixie,' and that showed me that many a once bitter memory had passed away forever. I am glad Decoration Day has been made a national holiday and that in the South as well as in the North it is being observed. With a few more years of the peaceful, quiet and honest National Government that President Cleveland is giving the country there will be no longer a reason for any exhibition of sectional prejudice among the extremists on either side of the late contest. The South is progressing rapidly under the new system of things, and we want no change for four years more in the head of the Government. If Mr. Cleveland will take another nomination, and I think he will, the South will go up at the next National Convention with no other name but his to place at the head of the ticket." Thirty-four years ago, lacking a few months, the editor of The Times and Democrat came to Orangeburg a stranger, moneyless, but young and hopeful, bearing a letter of introduction to the Hon. Samuel Dibble, then in the vigor of a robust manhood, and one of the leading lawyers of this section of the State. Never shall we forget the cordial words and the warm handshake he gave us after reading that letter. From that day to the day of his death the editor of the Times and Democrat has esteemed it an honor and a privilege to number the Hon. Samuel Dibble as one of his warmest and truest friends. He is gone, but we shall never forget him, and sometime, somewhere, we shall greet him again. Mr. Dibble was no ordinary man. He was a highly educated, cultivated gentleman, but at the same time modest and unostentatious in his bearing. He loved South Carolina and her honored history and traditions, and was ever ready to serve her whether on the tented field or the forum. He entered the Confederate army a young man at the beginning of the war and surrendered with the remnant of that grand body of men at the close. Having done all he could to achieve Southern Independence and failed, he accepted the result, and went to work to build up the desolate State. It was leaders like him that encouraged the people and enabled them to make the South prosperous and happy again. He was a brave and wise leader during the reconstruction period, and did his full share to redeem the State from the polluting rule of the stranger and alien. He was a valued member of the State legislature, and as a Congressman he was attentive and diligent in the discharge of his duties, and every part of his district was carefully looked after. He met every duty, and his example helped to make good, sound and strong communities. He was ever willing to serve Orangeburg. He was a good useful citizen who was always willing to serve when his services were needed, and our people will hold his memory in love and reverence. In speaking of Mr. Dibble's death, The State [Newspaper] says "his mind was always at work for the solution of practical problems that would benefit his neighbors. 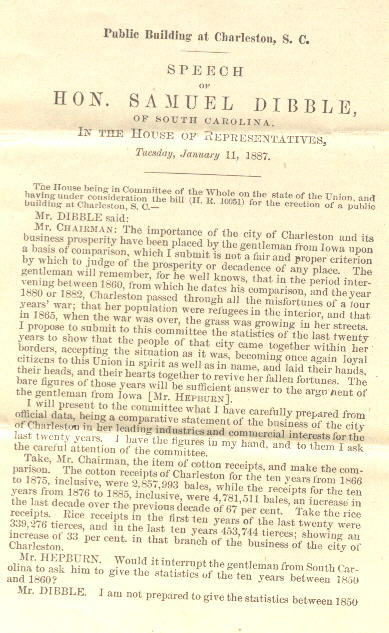 At a public dinner in Orangeburg some six or seven years ago, we heard him deliver a little address, in response to calls, in which with convincing clearness he pointed out the need of a railroad to connect the city of Orangeburg with the western part of the county in the direction of Springfield. That railroad has lately been built and it was Colonel Dibble's idea -- it is tangible, lasting proof of the value of a capable and thinking man to a community." At another time he advocated a railroad from this city to Lexington, and, as The State says, he always was at work to help his people. In the language of The State, "would that we might have had in South Carolina in the last half century more men of the type of Samuel Dibble." He was the first man to receive a diploma from Wofford College and he set a noble example for the hundreds and thousands of young men to follow in his footsteps at that admirable institution. Good, pure, honest and brave gentlemen have not been uncommon in South Carolina, but there was another side to Mr. Dibble's career that is not so often paralleled. He was a man of rare business capacity who liked to help in the development of his country. His work at Bowman is a monument to his energy and ability as a builder. Mr. Dibble lived to a ripe age, but his death came sooner than his friends expected, as up to a few months ago he was in fair health. He never lost interest in politics. Last year he attended the Baltimore Democratic Convention as a spectator with some friends, and was a strong advocate of Mr. Wilson as the nominee. We agree with The State that Mr. Dibble "deserves to be remembered with honor and affection in every part of South Carolina. A thousand men of his broad vision, his indefatigable industry and his sterling character would make of South Carolina in a few years the king of State that every good man longs for it to be." Orangeburg today mourns her most distinguished citizen. Died September 16, 1913, near Baltimore, Md. Buried in Sunny Side Cemetery, Orangeburg, S.C.